Cube 3 – Getting better and better! The folks at 3D Systems’ Cubify have been hard at work. Several revisions of the client software have been released since the first shipments of the Cube 3, but the most recent one, client 2.14, has improved the print quality tremendously. I was not paying much attention to additive manufacturing things over our Thanksgiving holiday, but I did check out this blog of my friend, Tom Meeks, for any news: cubifyfans.blogspot.com. If you have not visited his site, you should – he has extensive information on the Cube 2 and 3 machines as well as handy training videos and parametric modeling tutorials and much more. So as soon as I saw the post about the client update, I turned on my computer and the update was performed when I started the old client. 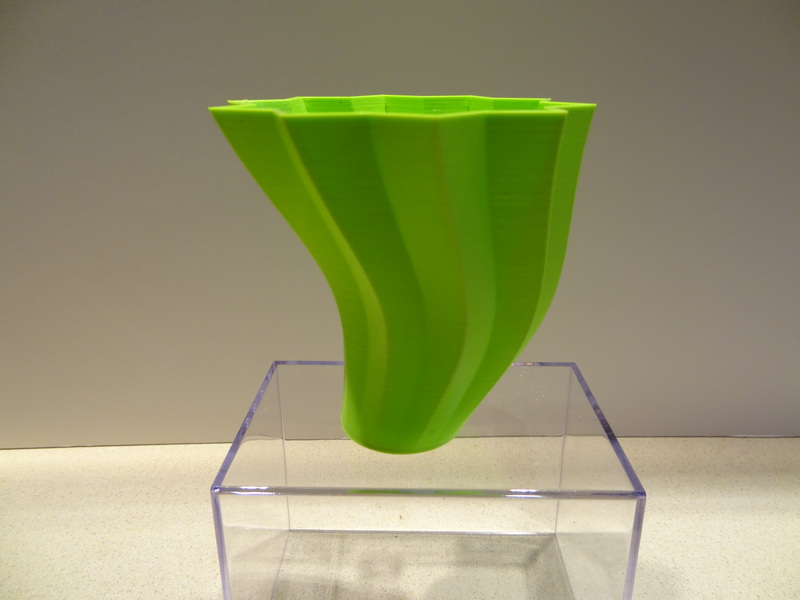 Added to my shelf was the “Ekocycle Cube Vase” – a flared and swirled vase model for free. I saw that as a great opportunity to test this out. And sure enough, the print was awesome! I did scale it down a little to use less filament and time (and with new shipments of cartridges perhaps a week away I can’t run out before then!). UPDATE: after one more client and firmware update, I tried the two-color vase that failed in my first use of the machine. It now printed PERFECTLY! I’ll get some pictures uploaded but it was easy to get it done, and there were but a few stray filament pieces which did not interfere at all with the print.